Q. What is the 'Psychic Journey' course ? Imagine how much better your life would be if you always made the right choices. How would you feel if you woke up every morning knowing that you have the power to fulfill your dreams ? ''The Psychic Journey' course addresses these issues and much more by taking you into the realms of greater awareness. It shows you step-by-step how to uncover your own true potential, using both meditative and physical exercises. It reveals how psychic and spiritual development can totally transform your life, while at the same time having an extraordinary and postive effect on everyone around you. Most importantly, 'The Psychic Journey' is written in a simple, factual style that will gently guide you to develop your psychic powers and make this complex subject understandable and accessible. Q. How do I know if I'm psychic ? Everyone has the capacity to develop psychic powers and experience psychic events. Psychic ability is not a gift only given to a select few. As with any other skill or talent, it has to be developed and nourished. And the more you use it, the better you get at it. The psychic dimension is accessible by everyone who is willing to exercise self-disciline and invest a small amount of time three or four times a week to develop his or her innate psychic abilities. The 'Psychic Journey' course will teach you how to tap into your own psychic powers and how to use these powers for the benefit of yourself, others and, ultimately, our entire society. Q. Can psychic development be dangerous ? When you develop your psychic abilies, you will open channels that may have been inactive or dormant and this can make you more sensitive to all energies - positive and negative. However, this should not discourage you from becoming more psychically aware, as long as you take steps for protecting yourself from unwelcome influences. An important part of the 'Psychic Journey' course contains exercises that will ground you and enable you to build a psychic shield around you that will protect you from intrusive or malicious vibrations. This is something that is often left out of other courses and books and can seriously affect your ability to develop psychic awareness safely. Q. What are the benefits of following the 'Psychic Journey' course? The majority of people who have used the 'Psychic Journey' course feel that their lives have changed significantly. As a result of using the techniques in the course, they have found a natural confidence emerging. It is not unusual for people following the course to start to make important life changes. When you travel on the Psychic Journey, you live in the world differently from the ordinary person. You look at life differently and respond to it differently. You know that you will be helped with each experience you face, however difficult. It is a journey of trust and belief. Q. Do I need to be able to meditate ? Meditation is quite simply the art of relaxing your body and mind. Learning to meditate sharpens your awareness, increases your concentration and assists in quietening our internal, mental chatter. It helps to shift mental patterns of vibrations and allows you to connect to the universal energy of psychic experiences. The 'Psychic Journey' contains exercises that will enable you to meditate quickly and easily, even if you have never meditated before. It will teach you how to combine meditation with visualisation techniques that will open up your psychic channels and lead you to a happier, richer, calmer and fully life. Q. Will I receive any bonuses when I order ? You may have noticed that some courses are offered with bonus gifts. In many cases, these bonuses are 'valued' at many times more than the course itself ! So how can a course that costs, say, $99 come with over a $1000 of bonus gifts ? Well, the truth is these bonuses are pretty much worthless. In most cases, they can be picked up for free on the internet, and the rest can be bought (with resale rights) on ebay for a dollar or two. And the reason they are free or cost just one or two dollars is that they are low in quality and short in useful information. We will not insult you - nor will we devalue the'Psychic Journey' course - by trying to entice you with offers of worthless bonus gifts. 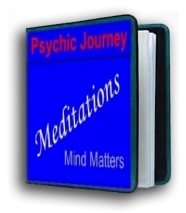 The 'Psychic Journey' is a valuable resource that will bring you immense benfits. It stands on its own, without needing to be supported with flimsy offers of valueless 'bonus' material. Q. What happens if I have questions ? The psychic who authored the course will be happy to answer any questions you have about the course or need advice and guideance on matters of psychic development. Just email us and you will receive a prompt and helpful reply. "What an incredible course ! I have seen my psychic powers grow and develop. I thought I might have some psychic ability, but I never imagined that I would be able to do the things I've discovered I can do. I 'm delighted both with the course and also with the excellent customer service. Thank you !!!! " 'The Psychic Journey' is the ultimate guide to psychic development. It shows you step-by-step how to uncover your true spiritual potential. It reveals how psychic and spiritual development can completely transform your life and have a positive effect on everyone around you. The Course has been written in a simple, factual style making the subject both easily accessible and fascinating. By following the structured approach, you will find yourself 'tuning in' to the universal energy and living a better life than you ever imagined.